I'll be honest, before we made this persimmon pudding, I had never had a persimmon before. But there they were, in the same display as the fresh cranberries at the grocery store. And here is what you do with a (actually, 4 small) fresh Persimmons. Persimmon pudding is similar to traditional Plum of Fig pudding in that it's dense (like pumpkin pie filling) and deliciously spiced for the Holidays. Preheat oven to 300f. Oil/Grease a 9x13 inch baking dish. In a bowl, whisk together the flour, baking soda, baking powder, salt, cinnamon, white sugar, and brown sugar until uniformly combined. In a large bowl, beat the eggs and Soymilk together and then add the flour mixture, alternating with the persimmon pulp in several additions, mixing well after each addition. Stir in the melted Margarine. Scrape the batter into the prepared baking dish. Bake in the oven for about 1 hour, or until a toothpick inserted into the pudding comes out clean. Allow to cool before serving. Serve with a splash of soymilk or Soy "Holiday Nog" (which is sweetened, spiced soymilk that comes out around the holidays here in NY). I tried this out for the first time a couple weeks ago and HOLY COW! This is basically a recipe for chicken fried rice with the best flavor and texture combination I've ever had. End of story. And, I'm finding that a lot of the spices that are used in traditional Indian cuisine are very similar to the spice palate we associate with the holiday season here in the U.S.A. So, basically, this was nothing short of perfect. AND my kids enjoyed it too! First, marinade the chicken. It's very important to have your chicken nice and evenly flavored. I marinated mine overnight. In a small bowl whisk together, chilli powder, 1 inch chopped ginger, 1 clove chopped garlic, soymilk, lemon juice and salt. Pour over the chicken and allow to marinate for several hours in the refridgerator. Once the chicken is done marinading, cut the meat off of the bones in bite-sized pieces and set aside. Soak rice in enough salted water to submerge for 30 minutes. Heat about 2 tbsp of olive oil on medium in a large pot. Add cinnamon, cardamom, cloves, cashew nuts, and fennel. Saute until the nuts turn light brown/toasted and the spices become fragrant. Add chopped onion, green chilli paste, and curry powder. Continue cooking until the onions become translucent. Add chopped tomatoes, remaining minced garlic and minced ginger, garam masala, turmeric powder, and parsley. Salt to taste and continue cooking until the tomato has permeated the rest of the mixture. Add the chicken and brown it on all sides. Add rice (undrained!) and coconut milk. Bring to a boil and then cook on low for about 25 minutes or until all the liquid has been absorbed. Baek (white) Kimchi: Vegan, mild, and all the probiotics of its spicy cousin. A while back I made a batch of Traditional Korean Kimchi. It came out beautiful and SUPER spicy. Like, definitely too spicy for the kids an me. My husband and one of our friends decided that it was best enjoyed on hotdogs and they devoured quite a bit of it that way. HAH! I think that it would also be really well suited to flavoring different things... Hot and Sour soup comes to mind. I decided to do an Americanized version of White Kimchi in response to the SUPER-HEAT of the other variety. I wanted something more slightly spicey and mostly sour and I'm pretty sure this is going to hit it right on the head. Again, I switched up some of the traditional ingredients to include things that are easily accessed in most Grocery stores in the U.S.A. Core and chop cabbage into small pieces. Put in a large bowl and sprinkle 1/3 cup of salt evenly between the leaves. Fill the bowl with enough water to submerge the leaves, and then weigh them down with a plate. Let sit on the counter for 24 hours. Drain and rinse the cabbage lightly, retain about 1 cup of the brine. Assemble some mason jars and lids (I had various sizes this time, my daughter helped and she was the one who picked them out of the cupboard). Wash the jars and caps thoroughly and set aside. Prepare the remainder of your ingredients and toss them together in a large bowl. Sprinkle 2 tbsp of salt on the veggie bowl and toss. Then add the veggies to the cabbage and toss again. Pack your veggie mixture hard into the mason jars ( I used a rolling pin) so that water starts to be extracted from the veggies. Top off the jars with enough brine to cover the veggies. Cover and seal with caps and rings. Wait about 7 days before trying. And then transfer to the refridgerator. Eat it all right away, or wait until the sour "pickle" flavors develop further. Indian cuisine is something that I have had very little experience with outside of the occasional off-handed addition of curry powder to various things. The more I look into creating my own favorites from scratch, the more I realize that there is SO much variation it's a little silly to think of any one flavor or texture as being quintessentially "Indian". And with that said, an extremely common ingredient used in Indian food is Ghee, or clarified butter. Easily replaceable in the kitchen at home, but hard to avoid when it is being cooked for you by others. And this, I suppose, is my main excuse for having never gotten familiar with Indian food. Until now! I put a shout out on social media and was met with a couple of different favorite dishes: Khichdi, and Biryani. There are so many variations out there to choose from, and I went with a highly aromatic vegatarian version of Khichdi, and will be trying out a Coconut milk-based version of Biryani sometime in the very near future. The Khichdi I made turned out to have a gorgeously balanced flavor combination, with warming green chili and a beautiful rizzoto-like texture. Perfect for a chilly late-autumn evening. Soak lentils and brown rice in a bowl with enough salted water to cover them for 30 minutes. Heat olive oil on medium heat in a large pot and add spices. Stir until fragrant (2 minutes) and then add garlic, onions, and chilli paste. Cook for another 2-3 minutes and then add your veggies. Stir and cook for another 4-5 minutes. Drain the lentils and rice and put them in the pot. Stir everything to combine. Add salt to taste and 4 cups of water. Stir, cover and cook on low until most of the water is absorbed (around 30 minutes). Continuing on with the theme of winter squash, I put together a kabocha-kale tart. First, roast your kabocha squash. Then, put together a single pie crust. Scoop out squash into a large bowl. Heat some olive oil in a pan. Add garlic, salt, and kale to the pan and saute until the kale is wilted. Combine egg, soymilk, lemon juice, and tofu in a bowl. Salt to taste. Mix the tofu-mixture in with the squash. Add the kale to the squash mixture and fold together. Fill the pie crust and then top with chopped pecans and Daiya cheddar shreds. Bake the tart in the oven until the crust becomes golden brown and the pecans are toasted (30-45 minutes). I've been meaning to try out this project for a while now, but every time I go to the store there's 1 or more ingredients that I can't find in order to make a *truly* traditional Korean Kimchi. So I thought, why not do it anyway? With ingredients that are readily available to most anyone in the United States? I'm glad I tried this out because it's a really fun and dynamic ferment with a lot of bubble action to keep everyone entertained! 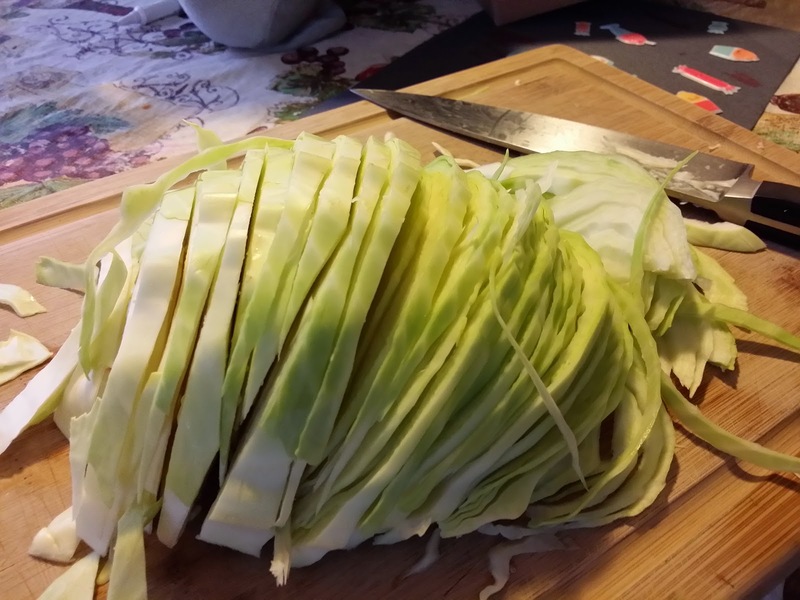 Cut the cabbage in half lengthwise, then crosswise into 2-inch pieces, discarding the core end. Place in a large bowl, sprinkle with the salt, and toss with your hands until the cabbage is coated. Add enough cold water to just cover, making sure the cabbage is completely submerged Cover/weigh down with a plate and let sit at room temperature for 24 hours. Place a colander in the sink and drain the cabbage retaining about 1/4 cup of brine in a seperate small bowl. Gently squeeze out the excess liquid and transfer to a medium bowl; set aside. Assemble your radishes, scallions, pepper mix, ginger, garlic, and sugar in a bowl. Add the fish sauce and toss everything together. Separate out some of the thicker/bigger chunks of cabbage and reserve ( maybe 10 pieces should do it). Pack your kimchi tightly into 2, 1 quart size mason jars. Place the bigger chunks of cabbage over the top so that the small pieces don't float up to the top during the ferment. Add an extra shake of fishsauce to each jar for good measure and then top off with the reserved brine if your kimchi is not yet completely submerged in liquid. * Most recipes don't worry about this last little step with the brine and making sure everything is 100% submerged. It's been my personal experience that you're always better off with complete submersion to avoid mold/yeast contamination. Cap tightly with lids and rings. This is a fairly quick ferment and very active. I am currently on day 5 of the ferment process. Days 2 through 4 required me to burp the jars at least once every few hours (I ignored them overnight though and they didn't explode... so that was a plus!). Most people say that Kimchi is ready to eat on day 7, but that it improves with time and continues to improve in the refridgerator for weeks after the initial room-temperature ferment. The outdoor farmstand down the street closed up shop this weekend. What popped into the grocery store was local cabbage and the first pomegranates of the season. Cabbage... hmm. Not the most show-stopping vegetable in the world. But it's widely available, inexpensive, super fresh, and loaded with great stuff like vitamin A, B, C, E, calcium, magnesium, iodine, iron, and phosphorus. Ok. I'll bite. I brought home 2 different kinds of cabbage. (American) standard green cabbage and Nappa cabbage. I'm currently in the process of fermenting a batch of kimchi with the Nappa cabbage, and I made a (BIG) batch of Nasi Goreg out of the Standard cabbage. I also have 2 quarts of Traditional Sauerkraut fermenting away right now that will be ready right around Thanksgiving time. 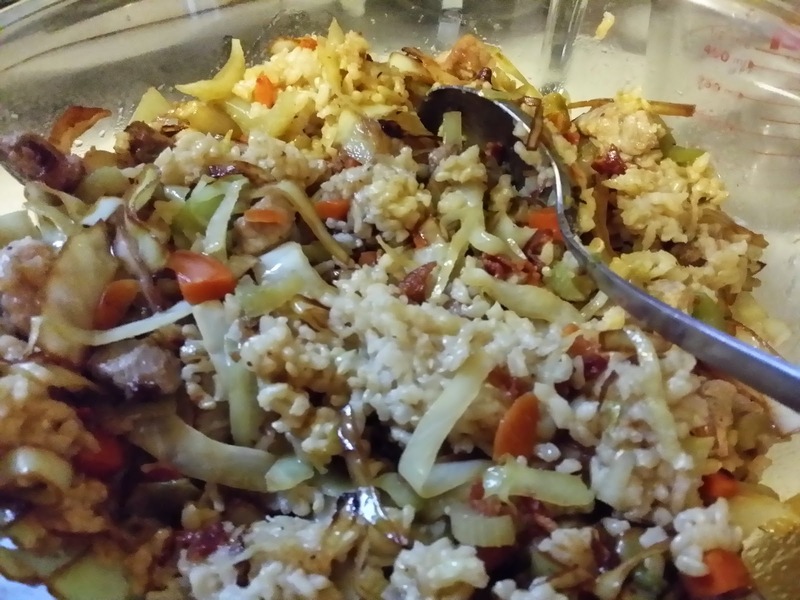 My recipe for Nasi Goreg comes to me, oddly enough, from my German grandmother. As the story goes, after WWII my grandma met my grandpa and moved to the Netherlands. Then Grandpa was drafted into the Dutch marines and was sent to Indonesia. This was one of the recipes he brought back with him! My version has a decidedly European flare but to me that's what makes it so wonderful and accessible. There's no need to go to a specialty store for the ingredients. Cook your pork. Slow cook your pork shoulder in a crockpot with water, salt, pepper, and onions for 4-6 hours and then shred it up. Or, if you chose a different cut of pork, cut it into 1 inch cubes, and brown it in a skillet with about 1 tbsp of soy sauce or fish sauce and 1 tbsp olive oil. Then add water to the skillet, cover and steam it the rest of the way through. Remove the meat and retain the liquid in the pan. Set aside. Prepare the brown rice by cooking it in 4c water with one cube of boullion. Core and slice up your cabbage, celery, carrots and onion. Toss them all in the pan with the pork juices and allow to cook until the cabbage becomes translucent (or, if you had pork shoulder and didn't use the pan to cook in, start off with 2 tbsp olive oil and 1 tbsp fish sauce or soy sauce). In a seperate pan, fry up the bacon until it's crispy and then fry up the sliced onion. Go ahead, use the bacon fat to cook the onion... it's customary! Then, combine all of the ingredients in a LARGE bowl. Stir and add soy sauce to taste. I love to serve this with a fried egg on top! This recipe is definitely labor intensive and it makes A LOT of food. My family usually eats it for dinner on Christmas Eve when there's at least 8 people to feed, otherwise you'll have a nice bunch leftover for lunches during the week. Thought I'd share how I used some of my pumpkin butter, and kept my kids happy when we ran out of snacks mid-week. I've been making a variation of this recipe for a long time, but this was the first time I've tried it with premade pumpkin butter... and the verdict is: Super-quick, easy, and yummy. This particular variation of the recipe rivals the simplicity of putting together a cake or quickbread out of a box... and my youngest LOVED helping every single step of the way. Preheat oven to 350f. Sift together flour, salt, soda, and sugar. In a seperate bowl, combine the remaining ingredients. Pour the wet ingredients into the dry ingredient bowl and stir making sure not to over-incorporate. Pour batter into an oiled loaf pan and bake 50-60 minutes. In the past I've talked about apple butter, and roasted pumpkin, and pumpkin pie, and pumpkin puree, and pumpkin soup... but how about pumpkin butter? Ok Guys... THIS is the answer to how you can put pumpkin pie spice in everything this season. From scratch. With real pumpkin. Use this butter on crackers or toast for a yummy snack (my 2-year-old agrees) or in place of canned pumpkin or pumpkin puree in any baked good recipe. It's that easy. Oh, and it makes your house smell amazing while it's cooking. Give it a whirl! I know you have pumpkins sitting on your porch right now getting ready to be carved anyway... right? Carve out 2 pumpkins. Carve out all of the meat and reserve the seeds. Either carve the shells into jack-o-lanterns or use them as really cute soup bowls/tureens. Clean and soak the seeds in brine overnight to be roasted the next day. YUM! nothing better than crunchy Omega 6's and seasalt! Put the pumpkin meat into a large crockpot. Put in all the other ingredients and cook on high for about 3 hours, or until the pumpkin becomes soft enough to mash. Then, put the mashed pumpkin through a sieve to get all the remaining hard pieces/seed particles out of it. Put the strained pumpkin into an uncovered pot on the stove and cook it until the desired thickness is reached. I like mine to be the thickness of spreadable jam. When the house smells amazing and your toddler wanders into the kitchen asking "where's the pie???! ", you know it's done. I ended up with 2 pints of Pumpkin Butter from this recipe. 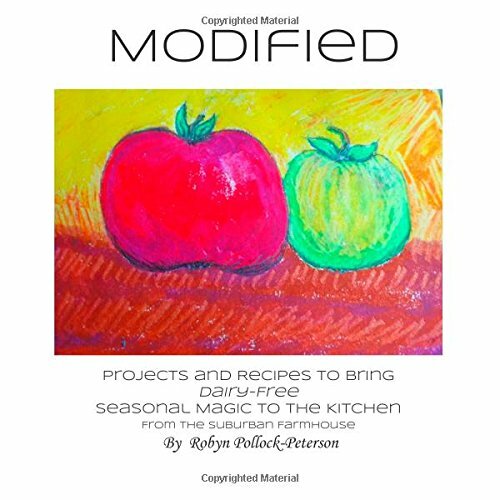 Either use right away or store in the refridgerator for up to 3 weeks unopened or in the freezer for up to a year. It is actually not recommended by the CDC to can pumpkin butter in a waterbath. So, small batches are key. I took the plunge and made a batch of Sauerkraut. This was an intimidating project for me to take on because of some of the preconceived notions I had about traditionally fermented kraut. 1) that it would need a special crock that I didn't own and didn't have any practice using 2) that it would inevitably get moldy and gross like so many people complain about and 3) that I'd be too grossed out to eat it after the 6 week process was complete with all that skimming and the different "phases" of fermentation which can sometimes be more than a little off-putting. I had read about how people make these huge 20 lb batches of kraut and *mostly* seal them and put them in a hole in the ground to ferment for weeks and about how Michael Pollan had a really hard time with mold infestation in his first (and only) 10lb batch. Then cabbage came into season. And it was staring at me at the store. It was only $.69 a lb... and a relatively small one somehow made it into my cart and then into my refrigerator. And there it stood... staring at me... taking up a TON of room right there on the top shelf. And so I gathered my tools, and my ingredients. First, core and chop up the cabbage, leaving the outer leaves intact. Then combine all of the ingredients into a large mixing bowl and get out a wooden rolling pin to crush the cabbage/start the process of brine creation. The salt pulls the water out of the cabbage, so if you have a really fresh cabbage there's no need for added brine! Stuff the shredded cabbage mixture into a quart jar, using the end of the rolling pin to really crush it down in there between handfuls. Then use the intact outer leaves to seal off any small pieces from the top of the brine. The key is that you DO NOT want any of the cabbage poking up above the brine or it WILL MOLD. Allow the jar to sit at room temperature for 24 hours. By the end of that time, enough brine should have formed to completely cover the top cabbage leaf. In my case, I had let the cabbage sit in the refrigerator for the couple days before starting my project. After 24 hours, my brine was about 3/4 of the way up the cabbage in the jar. I created some extra brine at a ratio of 1 tbsp seasalt to 1 quart of water and I topped the jar off. See? Nothing above the water line. I then decided to be extra careful and fit some wooden skewers across the top of the cabbage leaf (also completely submerged) to make sure that the bubbles coming up during fermentation don't push anything up above the waterline. This added precaution should completely eliminate the need to skim or otherwise mess with the ferment altogether. Today is day 3 of my sauerkraut ferment and it is starting to actively bubble. I've had to "burp" the jar 3 times to decrease the pressure build up under the lid. I'm expecting another 2-3 days of this rapid bubbling variety of fermentation, and the rest of the process will take about 5 additional weeks (tasting at 3 and 4 weeks to check for desired flavor/consistency. I'm really excited to see how it turns out and have a good feeling about this batch. I'm really happy that I decided to employ my tried-and-true fermentation method of using small batches of vegetables in mason jars. This was a very fun and satisfying project. 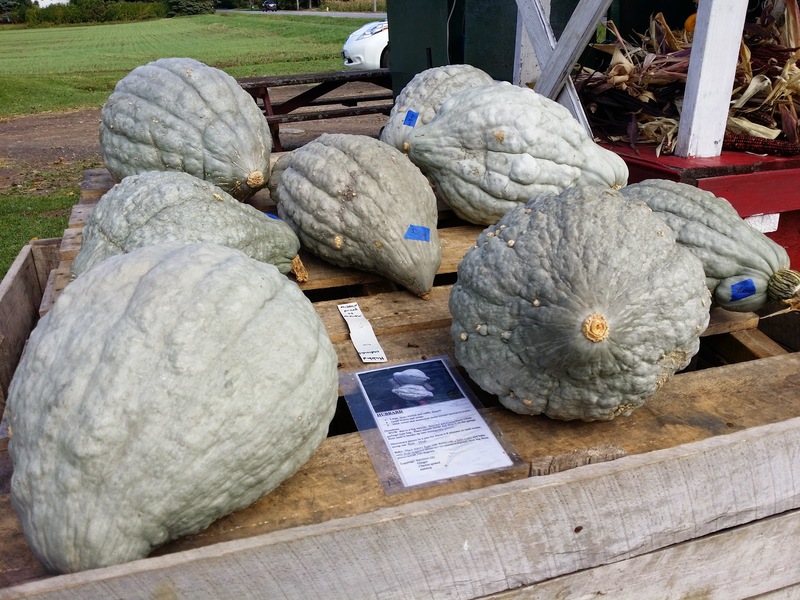 I hope everyone's been locating and trying out as many winter squash as we have this season. Remember that crazy hubbard squash I brought home and roasted? I ended up getting about 6 extra cups of puree out of it which I put in the freezer in the garage. Then I saw the apples on the table that my kids helped me pick out and made the connection that it was time for some creamy, delicious squash apple soup. This one is perfect for a rainy fall day. Put all of your ingredients into a large soup pot and bring to a boil. Reduce the heat to a simmer and cook until the fruit and veggies become tender. Puree in batches in a blender. Serve garnished with crumbled crispy bacon, nuts, a bit of soy sour cream, or a sprig of your favorite fresh green herb (Parsley or Rosemary would be nice). Enjoy with a nice chunk of fresh bread while the leaves fall outside. I've been looking for a good basic Hot and Sour soup recipe for years. A couple months ago, I found one and decided to try it out and tweak it once the weather turned cold. Well, here we are. I was expecting this to be too sour and spicy for my kids, but lo and behold they ate it! They especially liked the mushrooms and chose to eat them first. Hot and Sour soup is one of the 3 elements that I judge every chinese restaurant I go into by (the 2nd is their eggrolls, and the 3rd is how well they handle their seafood dishes). I'm picky and I've had A LOT of different variations. The recipe that I'm sharing here is very mild. Only slightly hot and sour... I'd call it more of a "warming" soup. You can always add more rice vinegar and chili oil at the table (which Mark and I did and it created a gorgeous, fresh, bracing experience). The Chinese traditionally use this soup medicinally as a starter course to help get the immune system moving and, with enough chili oil, to get the sinuses cleared. It's perfect for cold season and, in my opinion, for every other season as well. Soak the wakame in water until soft and then drain and set aside. Trim and discard the stems from the shiitake mushrooms and detach the Oyster mushrooms from the fleshy central part that holds them together. Cut the Shiitake caps into thin strips. Cut the tofu into 1/2 inch cubes. Place the stock, wakame, mushrooms, tofu, and bamboo shoots into a large stockpot and bring to a boil. Lower the heat to a simmer and cook for about 5 minutes. Stir in the sugar, vinegar, tamari, chili oil, salt and pepper. Add the starch mixture at this point if you decide to do so. Stir the soup thoroughly. Add the lightly beaten eggwhites by pouring slowly into the soup in a steady stream. Stir constantly while cooking until the egg white changes color/scrambles. Add the sesame oil just before serving. Garnish with scallion rings, and a little extra rice vinegar and chili oil (If you like things really hot and sour) and Enjoy! I served this soup with a side of homemade vegetable fried rice, and crispy tofu. Would You Just LOOK At All Those Beautiful Winter Squash?! Now What Do I Do With Them? 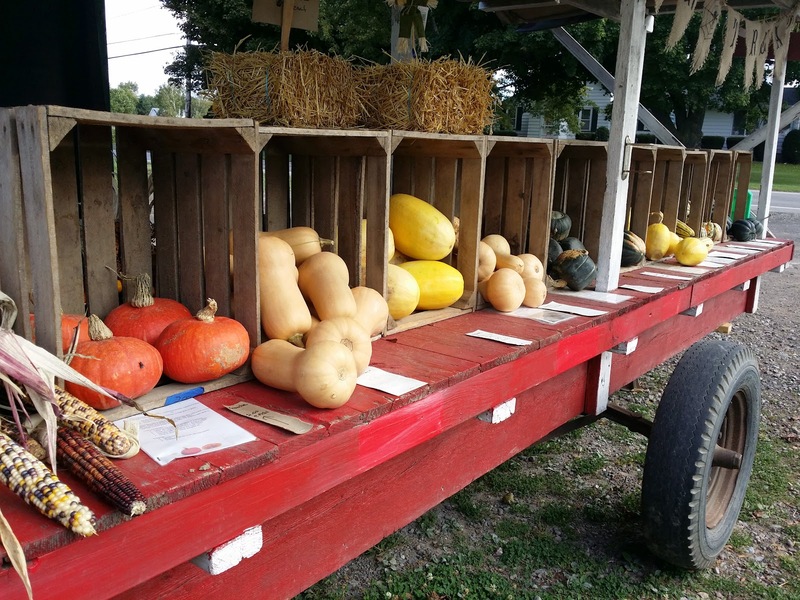 The squash at the roadside stand last weekend were absolutely beautiful. Except maybe for the Hubbards. Hubbard Squash were my own challenge of the season. Most people just use them as decoration outside to contrast the bright orange of pumpkins... and of course, I took this as an ultimate kitchen challenge. Hubbards are ugly, and bumpy, and HUGE! But they're also delicious. I picked up a modestly-sized one along with a bunch of other gorgeous varieties and have been cooking up a storm. My daughter helped me create this tablescape! And here is how we're dealing with all of these gorgeous ingredients (I needed one of EACH squash from the farmstand that day!). Delicata and Carnival Squash as pictured here in front of the Hubbard can be eaten in a number of ways. The easiest and quickest is to chop them up into slices, leaving the skin intact, and roast them with olive oil, salt, pepper, and an herb combo of choice (I like rosemary and thyme this time of year). Roast in a large casserole pan in a 400f oven until the skin becomes soft enough to penetrate with a fork. Another method that would work with these gorgeous squashes is to split them in half and use them as bowls to stuff with YUMMY Chestnut stuffing. I discussed how to do this recipe using Acorn Squash last fall right here. This recipe is one for a nice weekend dinner, or even for Thanksgiving. It's filling and could be a meal unto itself! Another cute little squash I couldn't pass up was this Kabocha. Kabocha squash sitting next to a couple gourds that volunteered to grow in our garden. If you're thinking, "Boy, that looks just like a pumpkin", you'd be right! It can be treated exactly like a pumpkin and that's what I intend to do. I'm going to Roast and Puree it (here's how to roast and puree a pumpkin) and I'll be making our first pumpkin pie of the year out of the puree. 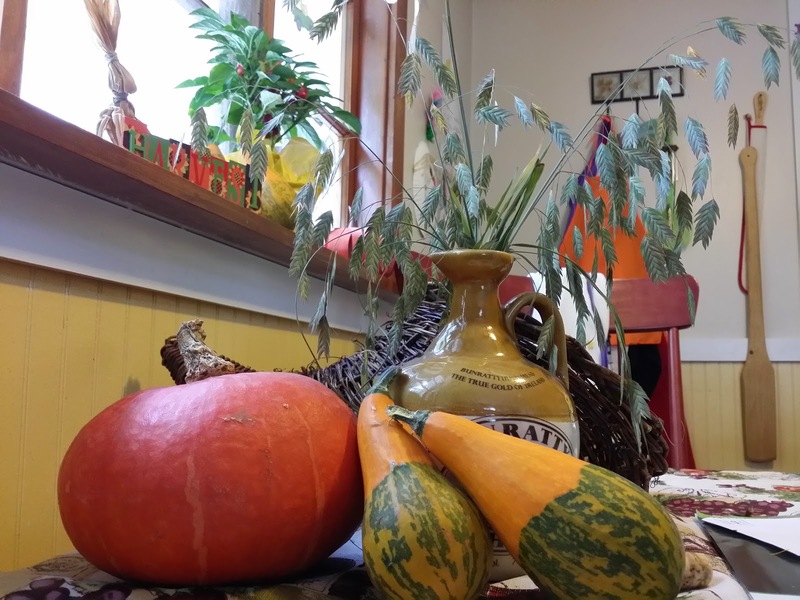 Pumpkin Pie Recipe and some awesome photos from last year, plus what to do with the seeds! And that brings us to THE MOTHER of all Winter squash: Mother Hubbard! These squash are huge, and meaty, and mild, and REALLY difficult to cut up. There are two recipes that I love for "dealing" with this gorgeous monster. The 1st, cut the top 1/4 off of the squash, scoop out all the seeds, roast it at 400f on the bottom rack of the oven until hot*, and then pull it out and use it as an edible soup tureen at a party. This Autumnal Warming Soup would be lovely in such a tureen!